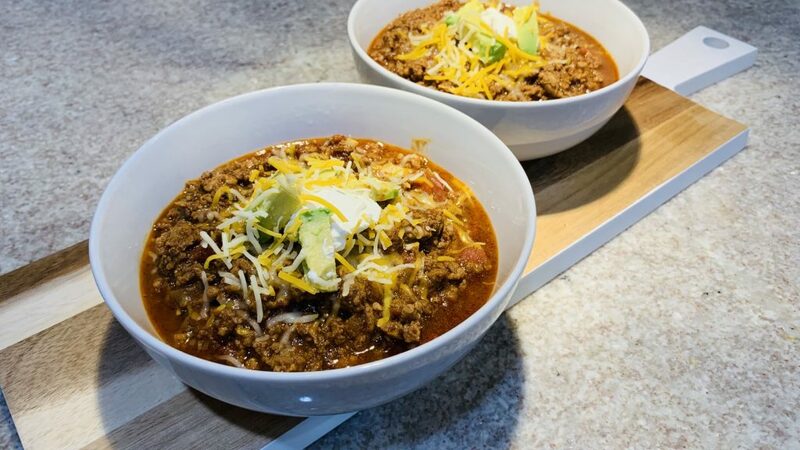 Hearty and comforting, this Beanless Chili Recipe is packed with beef and pork, tomatoes and a blend of chili spices the whole family will enjoy. 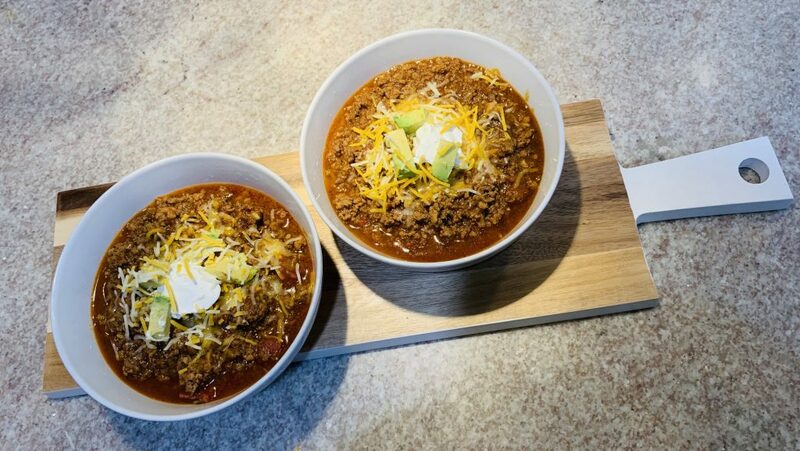 Chili is a hearty comfort food that warms you to the core, especially on cold nights. We are four days into spring now, and beautiful flowers are starting to pop out everywhere. The weather has been sunny, and I’m glad we’re done with snow for now. Even though it’s getting warmer in the afternoons, it’s still pretty cold at night (and every morning at the bus stop). 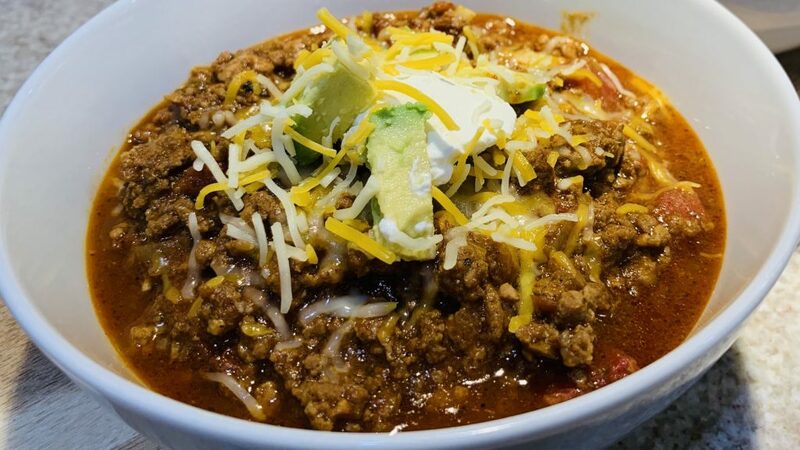 So, chili is great basically year round. Fall, winter, and spring and you can make some chili dogs in the summer. There you have it; a great meal any time of the year. Sometimes it is nice to have a Beanless Chili option, especially if you’re counting you carbs. Unfortunately beans have a lot of carbs despite all their fiber. So watch out for them if you’re eating Keto. 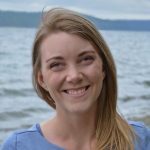 As a kid, I didn’t eat chili because I didn’t like beans. I would carefully pick around the beans if I had to eat it. 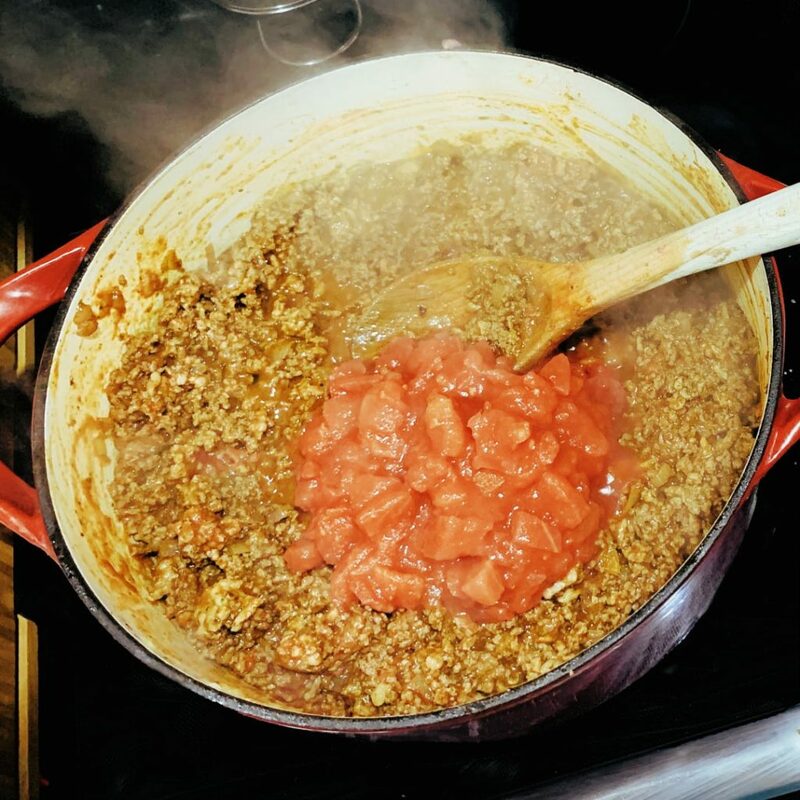 It wasn’t until I got married that I realized chili doesn’t have to have beans (don’t tell my dad). In fact, if you’re from Texas, you don’t put beans in chili. And, according to the International Chili Society traditional red chili does not include non-meat fillers, such as beans. 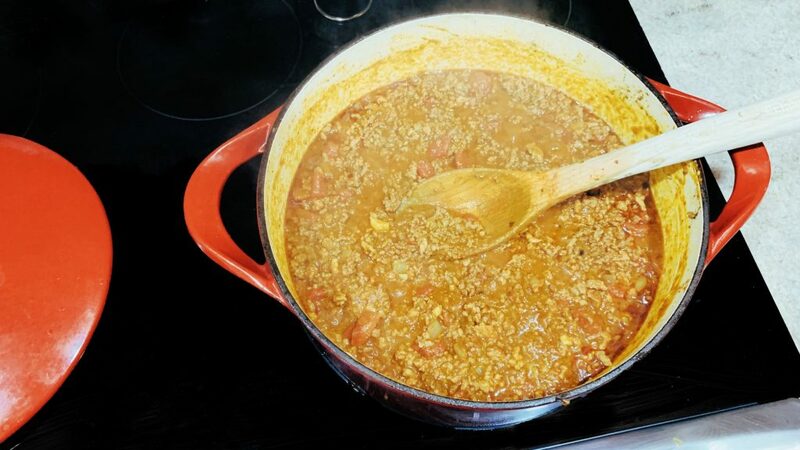 However, in homestyle chili, beans are required, according to the ICS. 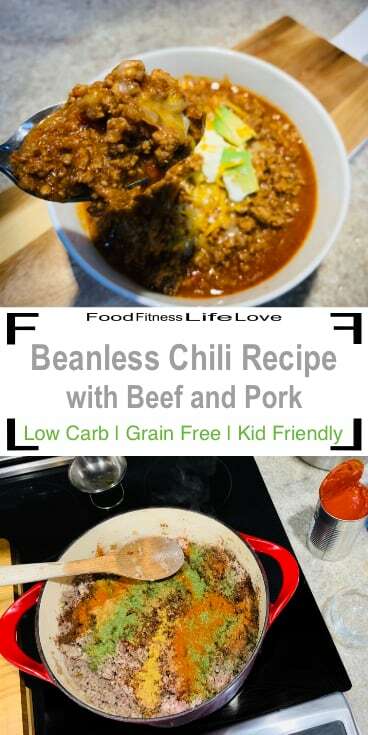 The truth is, in my family we like chili both ways, and this Beanless Chili recipe is great when you want to go the traditional, and lower carb, route. This Beanless Chili starts with sautéing diced onion with olive oil in a large pot or dutch oven. Once the onion starts to caramelize add chopped garlic. Cook the garlic briefly, and then add in ground beef and pork. Break up the meat and when it’s browned, add in chili powder, ground cumin, paprika, ground coriander, cocoa powder, and dried cilantro. 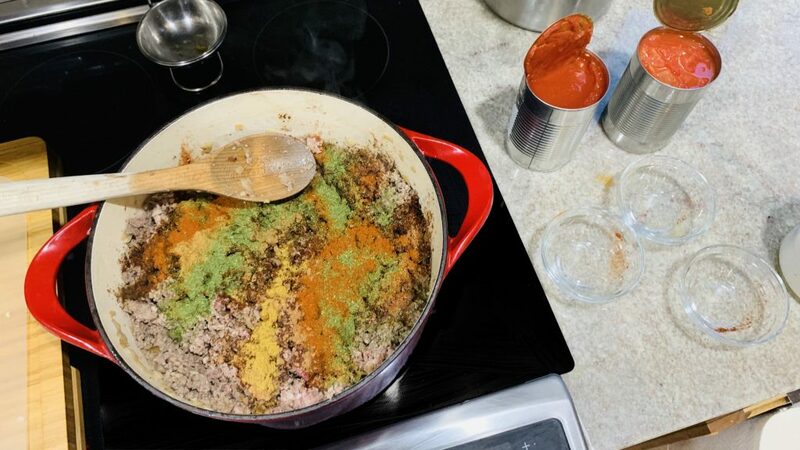 Mix the ground meat well with the dried spices to season through out. 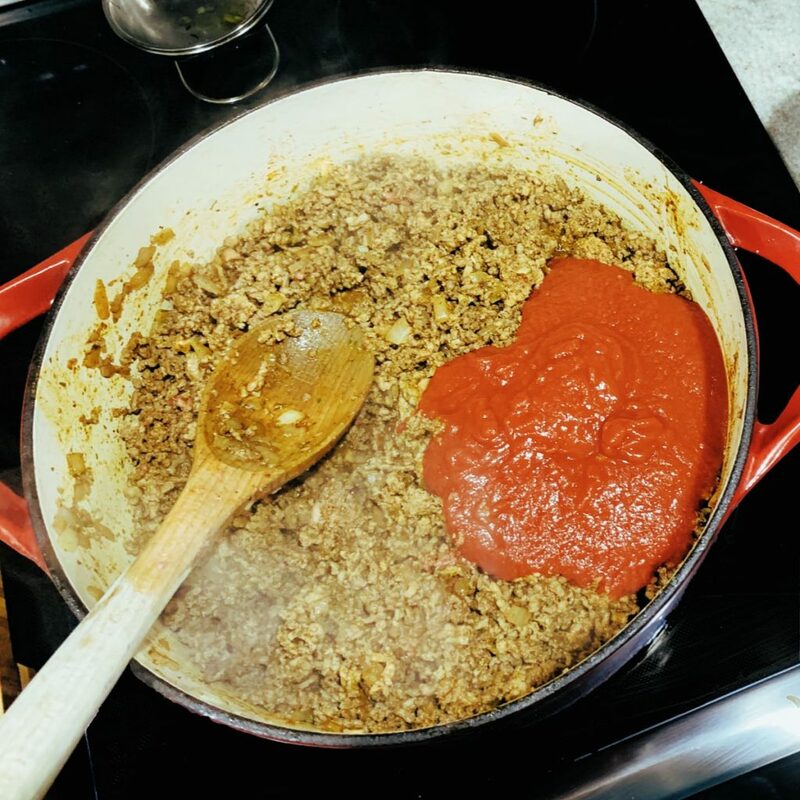 Once the ground meat it seasoned, add salt and pepper to taste. Finally, it’s time to add in the liquid ingredients. I used one can of tomato sauce and one can of diced tomatoes. 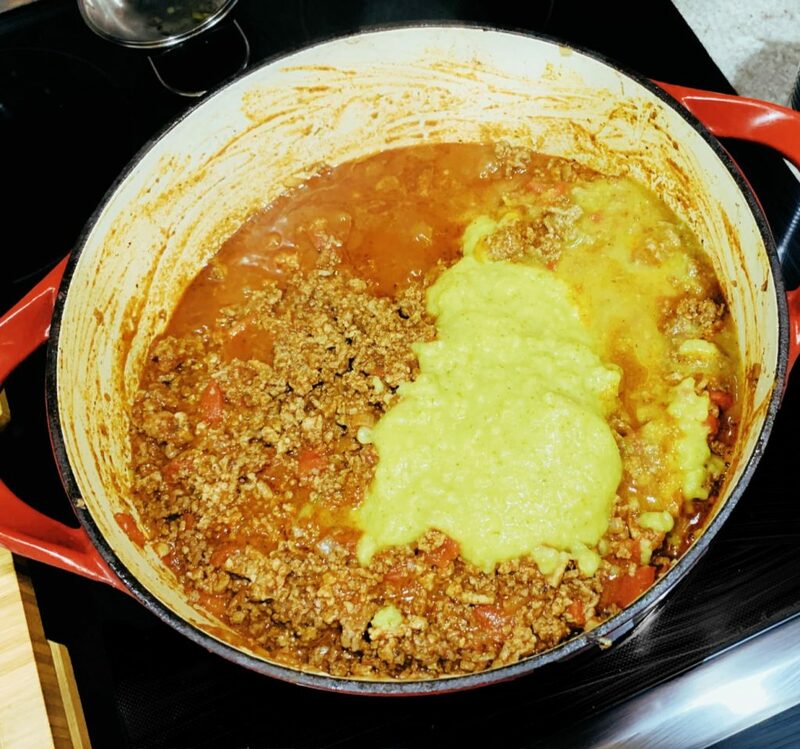 I also added salsa verde; it packs in a lot of flavor in one easy step. I don’t make my chili spicy because the kids won’t eat it. If you like you’re chili with some heat, add in hot sauce or cayenne pepper. My husband will add hot sauce to his bowl along with the toppings. It’s a great way to keep everyone happy. Let your Beanless Chili simmer on low for an hour. And then it’s time to eat. Top your chili as you like. Some of our favorite toppings are shredded cheese, sour cream, and avocado. 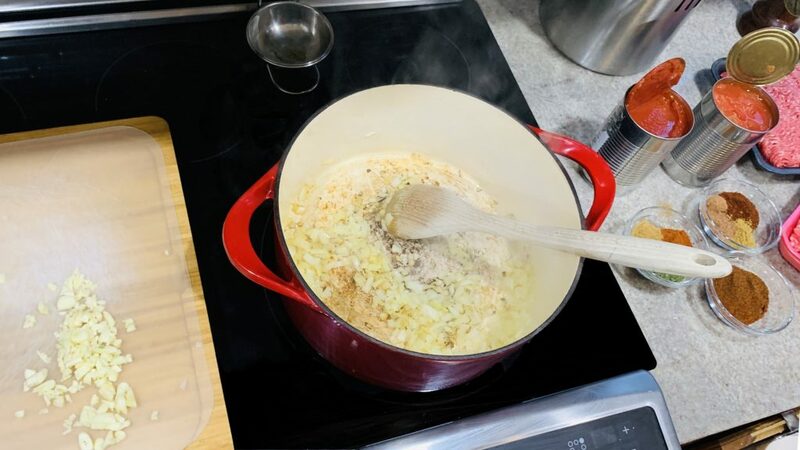 Preheat a dutch oven or large pot over med-high heat. While preheating dice the onion. Add the olive oil and diced onion to the pot. Cook the onion until it’s soft and starting to caramelize a little. While the onion is cooking, prepare the garlic. Once the onion is cooked, add the garlic and stir until it’s fragrant, careful not to let it burn. It’ll take less than a minute. 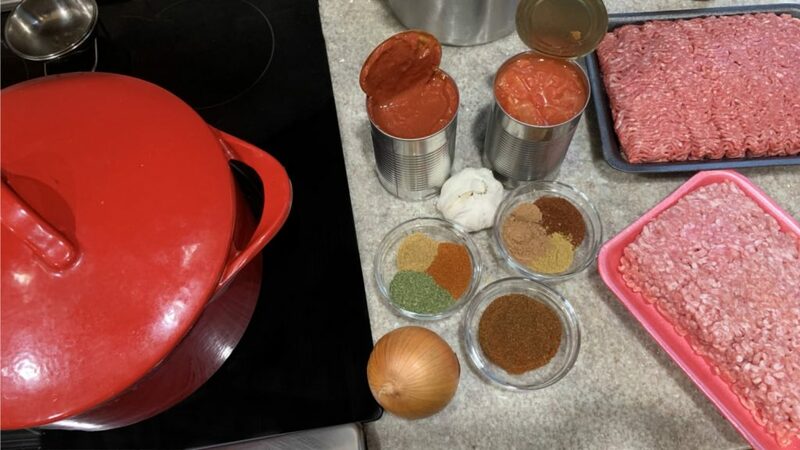 After all the meat is brown, add all the powdered ingredients: chili powder, ancho chili powder, cumin, paprika, ground coriander, dried cilantro and cocoa powder. Stir until all the meat in flavored. Add Salt and pepper to taste. Mix in the tomato sauce, then the diced tomatoes and finally the salsa verde. Cover and let the chili simmer for an hour. 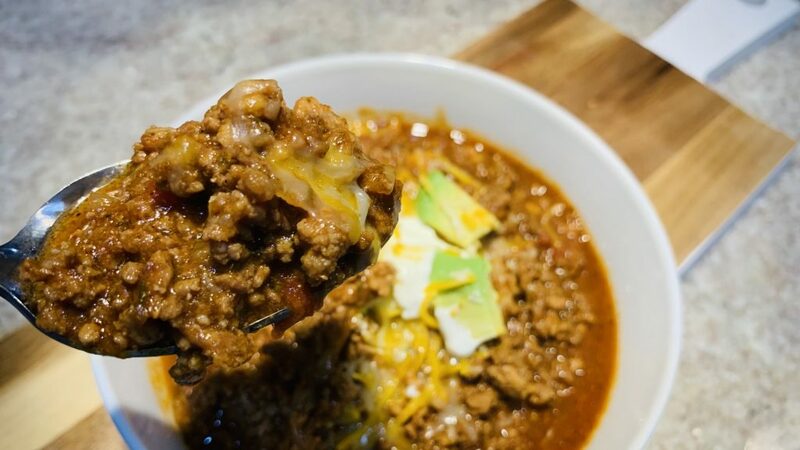 Serve the chili in a bowl with any toppings you like. Enjoy.